Sue Charlton 26/09/2013 Plate Up ! Hmmmm…. Alpine Restaurant opened a few years back, we went and had breakfast there and it was brilliant. Based on that, we had dinner there awhile later – not that great, ok’ish. For various reasons we have avoided the place – slow service being the main, limited menu for us. I have had a few business meetings there nothing that has remained in my brain cell. Tonight, I decided I wanted a cheese burger. 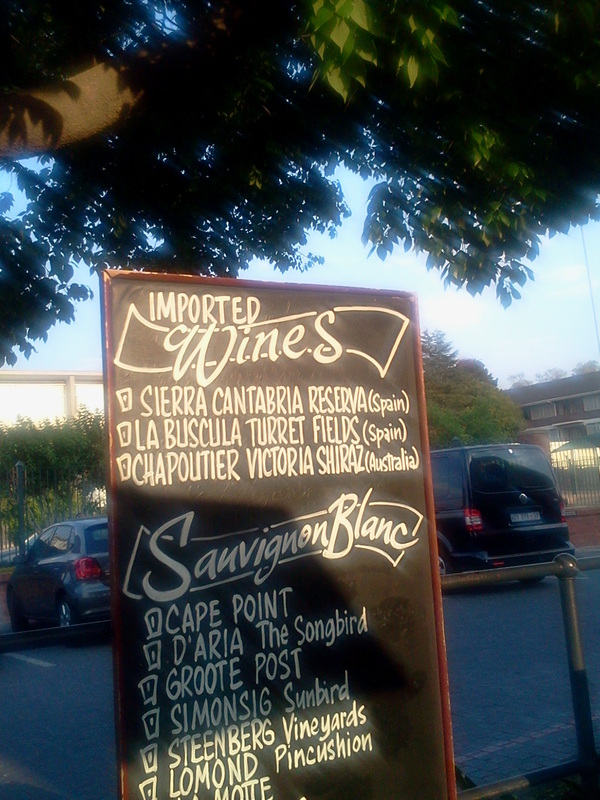 Couldn’t figure out where to go in Blairgowrie (Johannesburg area). I decided to give Alpine another visit. I decided to go off-peak and it was a good choice because the service was prompt and polite. It is not efficient in the peak hours and one can wait and wait! a nice glass of Merlot. My blog is not so much about the food, it is about the welcome, the ambiance, the crockery and cutlery and service and how one feels sitting there. 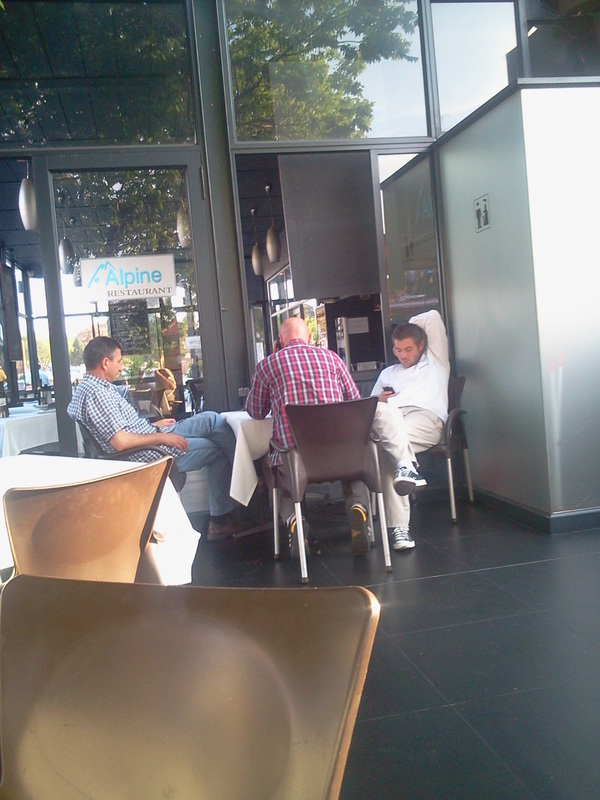 The management of Alpine seemed to be huddled to the right of me, three of them, on their cell phones, Galaxies, tablets, whatever. I was never acknowledged by them. One in a chef outfit was perpetually slumped in his chair (maybe it was his break) texting: some poor guy came in looking for a job clutching references and qualifications. Dear Chef hardly looked up from his phone yet made the man sit in a chair and then said no – that is really just so cruel. I hear this restaurant and the associated butchery is Bulgarian – all I can say it was like dining with the Bulgarian Mafia! 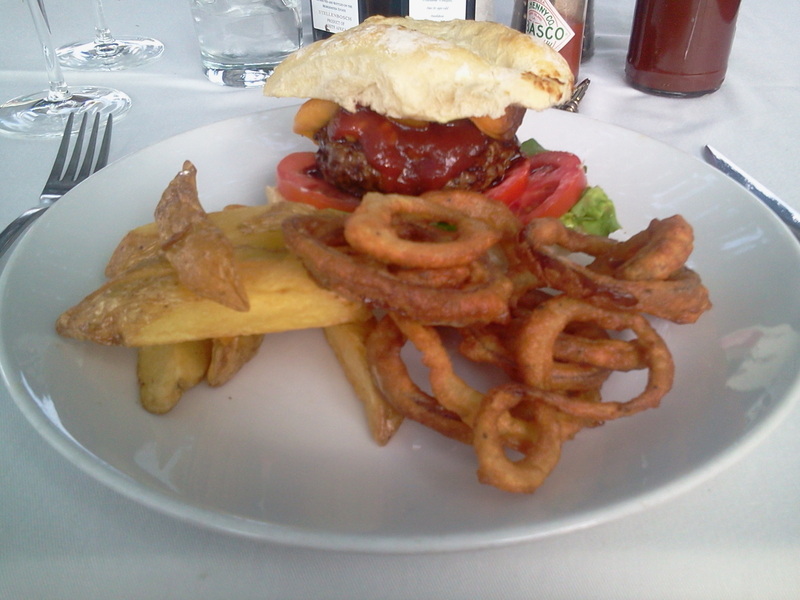 The burger arrived and visually looked fabulous. My first bite of the burger was a bit distracting because it didn’t taste pure beef – but that could be me! The potato wedges, mmm were they Woolies oven bake ? The onion rings were not bad, maybe they were oven bake also? Not a great burger. Disappointing. Not appetising at all and I would not go back there for a cheese burger. What really got to me – me wanting to enjoy a light meal, out of rush-restaurant-time and switch off and stare at the people and cars whizzing by – was the noise from the management team/owners whoever they were. Constant bleating on their cell phones. Total disinterest in their clientele. THEY looked BORED – great impact on a diner! The glassware was lovely, smart and fine. Crockery was smart and fine with a good sharp meat knife. I often eat alone, because it is my downtime and not because I need to. There are restaurants, bistro’s, fine and small dining that make you feel so very welcome as a ‘single diner’, Alpine Restaurant is not one of them! Always follow your recommendations and won’t go there. I really like this review! It isn’t always about the food (even though in this case the food was below par too) – but the atmosphere is important too. I hope this blog goes viral so that restaurant owners will be exposed to their clients’ experience! Thanks Sue.